These delicious cookies are like having a bowl of raisin oatmeal on the go. This is a guide about oatmeal and raisin breakfast cookies. These breakfast cookies are just as good as a big bowl of oatmeal, just as healthy, and much quicker. They can be taken with you to have with coffee mid-morning if you're not a breakfast person. Children like the idea of having a big cookie for breakfast to go with milk or hot chocolate. They are super-easy to make too. In a large mixing bowl, beat the eggs and add corn oil and melted butter. Mix until nice and thick. Add applesauce, cinnamon, and half the cake mix. Stir the cake mix in well, then add the other half box of cake mix and stir that in. Add raisins and nuts, if using. Mix everything together. Stir in the oatmeal. The dough is going to be very thick. If it seems too thick to work with, add 2 Tbsp. applesauce or more. Some oatmeal takes up a lot more moisture than others. Cover it with plastic wrap and refrigerate for about an hour. I love using parchment paper, and I can use it over and over while I'm baking in one session. That's usually about 8 pans of cookies, then I throw it away. It's done its job very well. For these breakfast cookies, I use about 2/3 cup of dough for each and with lightly floured hands, pat them out to almost an inch thick and 4 inches around or a little more. They don't spread much. I bake them at 350 degrees F for about 15-20 minutes. The cookies are going to still be pretty soft even after they've cooled on a wire rack. Do not allow them to over-brown. When completely cool, place them in an airtight container and refrigerate. When ready to eat or wrap to take with you, place one in the microwave for about 30 seconds at full power. I wrap it in a paper towel, and it's ready to eat right from the paper or pop it into a little plastic bag. The same dough works just fine for regular-sized cookies. Make them whatever size you like, bake them on parchment at 375 degrees F for 10-12 minutes. Cool on a wire rack. Source: I was in a hurry to get all the cookies baked one day, and decided to make some extra-large ones. The children loved them for breakfast and told me it was the same thing as eating a bowl of oatmeal. I had to agree. We've been making Oatmeal-Raisin Breakfast Cookies ever since. I would like to try this, it sounds delish! One question, why do you refrigerate? For that many, I would be tempted to just freeze the excess and thaw as needed, does that work for this recipe? Our bunch likes oatmeal, especially in the winter time, but there are often times when we're in a hurry to fly out the door. With this bad economy, I am looking for ways to stop the visits to McDonald's and Burger King for breakfast items. Sometimes I'm up early enough to make egg sandwiches on hamburger buns for them to take with them. 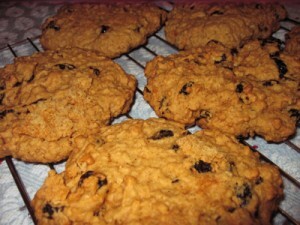 These Oatmeal Raisin Breakfast Cookies will be a nice change. It's a great idea. It's so simple too. Thank you for shaing it. Hi Kghsave. The refrigeration step is to cool off the dough as that will firm up the butter and oil that's in the cookie dough and just makes it a little easier to handle. You could cover and refrigerate it overnight if you wanted to, I'm sure. I've never frozen the dough, but I suppose you could. We've never had a problem with baking them all in a morning or evening baking session, and keeping them for the few days it takes for them to be all eaten up. Our daughter-in-law is in college, and has her study groups here several times a week. The young people are all medical students. Even so, they don't always eat as good as they should, so quite often "a little treat bag" goes home with them for the next morning. I didn't mention it in the recipe, but I will add sunflower seeds to the dough when I have them now. I'm still learning too. Thank you to you and MisMachado for the lovely feedback. Let me know when you make them and how you like the way they turn out.